People and animals can become sick or die from ingesting contaminated fish, shellfish, or water. 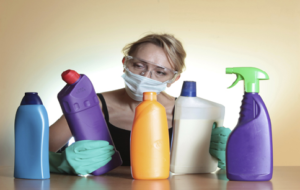 Use organic products (or the least toxic products) available for all projects around your home. Avoid spilling oil, gasoline, antifreeze, and paint on paved areas or onto the soil. If a chemical spill occurs, clean with rags or absorbent material such as sand or kitty litter. Sweep up absorbents and dispose of in the trash. Collect all used oil, antifreeze, and other vehicle fluids in containers with tight fitting lids and recycle at a local service station or DPW. Dispose of hazardous waste through the local Household Hazardous Waste Program (contact your local DPW for more information). Sweep up all outdoor home repair/construction areas on a regular basis and dispose of debris in the trash. Sweep driveways and sidewalks. Never use a hose for cleaning, as the water will wash pollutants into storm drains. Pour wash-water down sanitary sinks (or toilets). Never pour anything down a stormdrain. Store chemicals in leak proof containers inside a building or shed, or under cover. Do not expose hazardous materials to rainwater. Place a drip tray under chemical containers for extra protection against leaks. Avoid over-salting walkways and driveways in the winter, and use pet friendly ice melt products whenever possible. Hazardous wastes like pesticides, paint, solvents, used motor oil and other auto fluids can wash into stormdrains and poison aquatic life.